AMORIELLO is the name of the new project from guitar virtuoso Thomas Amoriello. Amoriello is a classically trained guitarist, and this is his first album. Amoriello wisely takes his musical knowledge (Master of Music Degree in Classical Guitar Performance) and combines it with inspiration from classic metal artists like YNGWIE MALMSTEEN, WHITESNAKE, BLACK SABBATH and DIO. He has brought in world class talent with him to record this album, including vocalist Mark Boals (YNGWIE MALMSTEEN, RING OF FIRE), bassist James Pulli (IMPELLITTERI), vocalist Goran Edman (YNGWIE MALMSTEEN) and drummer Vinny Appice (DIO, HEAVEN & HELL), among several others. Lead-off track “Holy Man, The Devil’s Hand” delivers the goods immediately, and showcases the talents of Mr. Amoriello, keyboardist Michael Troy, James Pulli on bass and Kenny Stavropolous on drums. This song dazzles with sterling power chords, and the biblical inspiration of evil vs. divine. Mark Boals really shines on this track, and I must say it is one of my favorite metal tracks of the year. 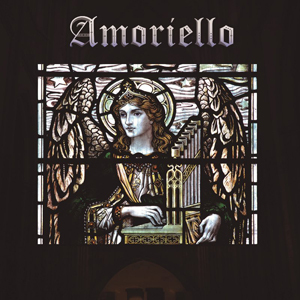 Amoriello plays the driving, determined riffs that Malmsteen used to employ back in the day. His solo here is fantastic also. You can view the lyric video for the song HERE. “Battle Song 1” is a tribute to Ronnie James Dio (R.I.P. ), and features vocals from current Malmsteen vocalist Nick Z. Marino, and drums by former DIO drummer Vinny Appice. The song features a spacy keyboard intro and a mid-tempo stomp that Ronnie would have loved. Vinny’s style is obvious right from the first snare hit. (Vinny even has a mini drum solo in the song that is very cool). Nick’s screams and Amoriello’s soloing accent a very good second track. “Nightmusic MCX” is an atmospheric instrumental that draws influence from classic guitar shred instrumentals, as well as oldies like “Walk Don’t Run” and “Rebel Rouser”. This masterpiece includes extended solos on both electric and acoustic guitar from Amoriello, keys again from Troy, drums from Shane Gaalaas (MICHAEL SCHENKER) and bass from Phil Soussan (LAST IN LINE). “Music Is The Monarch” features lead vocals from another Malmsteen alum, Mike Vescera. The song is a tribute to rock music (and Malmsteen himself) and includes lush keyboards mixed with Amoriello’s guitar. This galloping track harkens to the glory days of DEEP PURPLE’s proto-metal jams and features an acoustic passage in the middle. The track also features the talents of John Macaluso (ARK, YNGWIE MALMSTEEN) on drums. “Flood” is a ballad with all the class and touch of a SCORPIONS classic. It includes an incredible vocal from Goran Edman, (who sang on one of my favorite Malmsteen albums, Eclipse). It also features Neil Murray (WHITESNAKE) on bass and Atma Anur (CACAPHONY) on drums. “Atmosphere” is the second instrumental here. It features some acoustic guitar (played over Moog synth) that resets the mood and (of course) atmosphere. “Battle Song 2” reprises the theme of “Battle Song 1” and closes the album. Fans looking for a neoclassical guitar feast should look no further than this album. In fact, this album is much better than the past several Yngwie albums in my opinion. The mix of the album is very open and organic sounding, very fresh and each instrument is heard clearly and distinctly. Thomas Amoriello has penned these exquisite songs that fans of classical shred guitar should really enjoy. This album is around 35 minutes in length, and features world-class recordings that will stand the test of time. Amoriello is available now at the link below. Vinyl fans take note; this album is also available in orange colored vinyl format for a limited time.